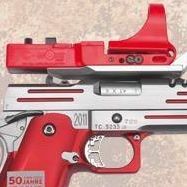 The focus of Prommersberger is in the field of large caliber handguns. To have sporting success, a specially tailored to the customer weapon is an indispensable basis. By being a member of the S & W Club 30-Germany, PROMMERSBERGER can offer you a large number of special versions of S & W revolvers. The international contacts and direct imports make it possible for you to get rare weapons models from all over the world.